September Is Dental Implant Awareness Month! Comprising of three elements, dental implants have a root, post (abutment), and restoration. This minor surgery is performed using modern technology and advanced dental training. 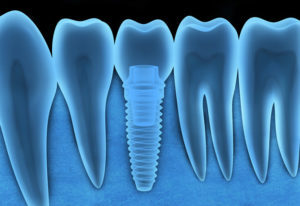 Dental implants are rapidly becoming the number one replacement for a single missing tooth or multiple missing teeth. When a tooth is removed due to decay, gum disease, or trauma, it can lead to low self-esteem and a range of health problems. You may experience difficulty carrying out regular functions such as chewing or speaking. The adjacent teeth can become harder to brush and may start to shift causing misalignment. Also, unseen changes can occur including the deterioration of your jawbone and TMJ issues. These problems are all avoided with the placement of dental implants. As mentioned, an implant has 3 components, which work together to restore your smile and protect your health. Titanium Root: The root is made of a biocompatible material and is surgically placed into your jawbone. Over time it gradually fuses with your natural bone to create a foundation for your restoration. Post: Placed on top of the root, the post acts as a support for the restoration. Restoration: Dental crowns, bridges, and dentures can be placed on to dental implants for a more secure and permanent restoration. At Fox Valley Dental, we use Zimmer Dental Implants with the assistance of computer-technology for even better results.